Are Mosquitos Taking Over Your Summer Fun? IDon’t let mosquitos ruin your warm-weather fun by taking over your outdoor space. Keep disease-carrying pests out of your yard, your barn or stable, or your commercial property by working with the Alabama mosquito control specialists at Skeeter Solutions. 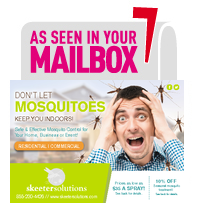 Skeeter Solutions can help rid your property of these annoying, potentially dangerous bugs so you can have the summer you deserve. Using cutting-edge technology and decades of combined experience eliminating mosquito populations in the Gulf, our team can provide you with the mosquito-removal services you need to enjoy your outdoor space. Imagine putting up a wall that mosquitos just won’t cross. 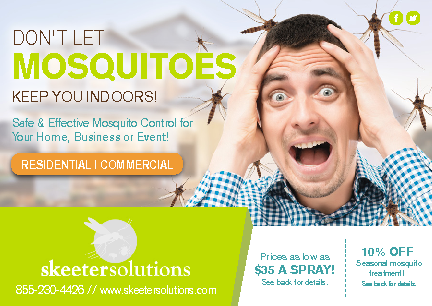 At Skeeter Solutions, we specialize in mosquito barrier spraying to keep unwanted pests away from people and animals. This long-lasting spray can keep mosquitos away for up to four weeks. The mosquito barrier sprays we use are safe enough for use in both residential and commercial applications. Restaurants, parks and public spaces can benefit from our highly effective mosquito control sprays. Get ‘round-the-clock protection all season long with a mosquito misting system designed by Skeeter Solutions. We’ll evaluate your needs and create a plan that works for your home, business or public space. An effective mosquito misting system can provide continuous protection against these pests, giving you the freedom to enjoy the outdoors without being bitten or worrying about the infectious diseases they carry. The mosquito barrier spray and the sprays used in our misting systems are derived from naturally occurring compounds. The active ingredients in our sprays are pyrethins—natural insecticides from the chrysanthemum flower. In addition to controlling mosquitos, pyrethins are also effective against spiders, flies, spiders, fleas, ticks and cockroaches. Pyrethins are commonly found in insecticides and lice shampoos because they’re safe and effective. They’re also eco-friendly; they won’t harm the environment or damage your grass, shrubbery or other plants. Call us at (251) 279-0345 to discuss your needs and set an appointment with one of our expert technicians today.